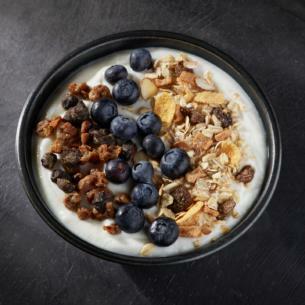 A generous bowl of protein-packed, nonfat, vanilla Greek yogurt piled with blueberries, muesli, dried dates and figs. Turn a good day into a fantastic day. nonfat yogurt (cultured pasteurized nonfat milk, water, sugar, fructose, modified food starch, natural flavor, vanilla extract, citric acid, vitamin d3), muesli (whole rolled oats, raisins [raisins, canola oil], rolled rye, apple powder [apples, calcium stearate], date powder, dried apples, corn flour, almonds, rice flour, sugar, cinnamon, malt syrup, salt, color [annatto, turmeric, purple carrot juice]), dried fruit (dates, figs, oat flour, rice flour), blueberries. may contain other tree nuts, wheat, and soy.